There are many types of head injuries. Serious head injuries cause a person to lose consciousness or have other neurologic problems. People with serious head injuries should be seen in an emergency department. 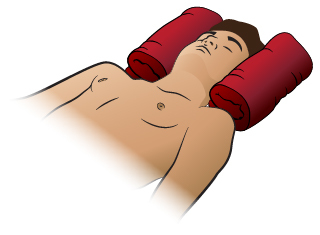 There is always a chance that a person with a head injury also has a neck injury. 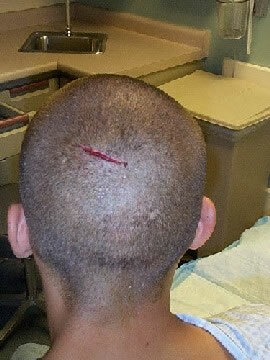 Skin: cut, scrape, bruise, or scalp hematoma ("goose egg"). Brain: concussion and other injuries. Signs of these are loss of consciousness, amnesia, or other Acute Neurological Symptoms. A concussion is confusion or change in mental state after a head injury. People do not always lose consciousness. Symptoms: these may include headaches, an upset stomach, or feeling irritable and sleepy. Most often, these are felt during the first couple days after a concussion. Other symptoms include amnesia, poor memory, trouble staying focused, and decreased coordination. People may not feel like their normal selves. They may feel dizzy, tired, or dazed. Diagnosis: this is done by a doctor. A CT scan may be needed. This is normal. Return to Sports: see the guidelines below. What to Expect: most people who get a concussion fully recover. They will have no lasting problems. A person may have symptoms that last for weeks or months. When it is safe to return to play (RTP) depends on the person. The athlete should be free of concussion symptoms at rest and during exertion before returning to full participation. RTP should follow a stepwise process as outlined in the Stages below. The stepwise process through these stages may take days to weeks. Typically, each step should take 24 hours; a patient-athlete would typically take one week to proceed through the six stages assuming that he/she has no post-concussion symptoms. If concussion symptoms recur at any stage, then the patient should drop back to the previous level for another 24 hours. Multiple concussions will need more time to recover. Athletes with concussions are sidelined to stop them from getting a "second impact injury." This is a second concussion that occurs before the first one has healed, usually within 1 or 2 weeks after the first one. It can sometimes cause a more serious brain injury. Always consider the chance of a neck injury in people with head injuries. There are many types of head injuries. There is skin (scalp) and bone (skull) on the head. There is also tissue (brain) in the head. These can all be injured. You can treat minor cuts, scratches, and bruises at home. Put an antibiotic ointment on the wound daily. If pain lasts over 2 days, apply heat to the sore area. Use a heat pack, heating pad, or warm wet washcloth. Do this for 10 minutes, then as needed. Observation: The person should be watched closely during the first 2 hours after the injury. You should wake him or her up 1 time every 4 hours for the first 24 hours. Check that he or she can walk and talk. It is normal for him or her to have a headache, upset stomach, or feel dizzy. Diet: Drink clear fluids at first in case you vomit. After 2 hours, you can go back to your normal diet. What to Expect: Most head trauma only causes an injury to the scalp. Pain and swelling most often get better 2 to 3 days after an injury. Swelling is most often gone in 7 days. Pain may take 1 to 2 weeks to go away. This position is termed the High Arm IN Endangered Spine or HAINES position. Both legs are flexed at the hip and the knee resulting in one lying on top of the other. The modified HAINES position results in a more neutral position of the spine making it preferable to the lateral recovery position in the management of patients in whom cervical spine injury may have occurred. Protect the neck from movement. 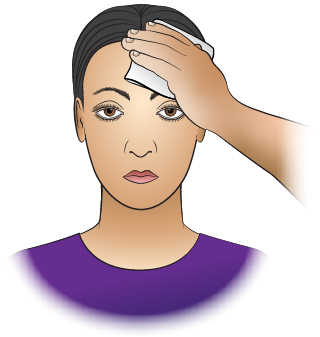 Roll up towels (or blanket or clothing) and place them on either side of the head to keep the head from moving. Don't move victim until a neck brace is applied.